Film news and reviews. Claudia Winkleman and Danny Leigh review Moneyball, The Deep Blue Sea and My Week With Marilyn. Plus Chris Hewitt counts down his top five sports films. Browse content similar to Episode 16. Check below for episodes and series from the same categories and more! underdog story. You have a team that has a $40 million payroll. that we could afford. Everyone else in baseball undervalues them. team, we change the game for good. It was never a movie about baseball. capable of by original thinking and courageous action. This better work. I'm kidding you. Danny, I don't understand sport. But I love, really love a sports film. You have a glint in your eye. exciting film. It is not a sports film but I would recommend it? wasn't going to be a single moment of slow-motion. Fine, what's left? about taking on the old guard, is it? That is what is so exciting. baseball" - there is none of that. You want to eat up the words? are right. For a confirmed Sorking fan, it's still recommended. Yes. and who is mentally unstable in many ways. She just falls in love. Blue Sea is an adaptation of the Terence Ratigan play from the 1950s. '50s. He's got this - he mentioned "luminous" - a good use of words. him. I thought it was beautiful, like you. I thought it was haunting. delivery. Then again wo, can. At number three it's rocky VI. Why? even about sport. Ten grand, I'm going win ten grand in one nights. like to be blessed with genius. of a sudden I have will in my arm. and a team of miss fits, while being amazingly funny. I'm really sorry. Are you all right? Why would you hit a girl? be pleased with that. This is going to run and run. Jonathan Levine and Seth Rogen. -- Joseph Gordon-Levitt. A tumour? time Would you describe what you're feeling as a kind of numbness? that's the internet. It's not that bad. That's better than I thought. You're going to be fine. Young people beat cancer all the time. happening to you." I'm moving in. No. No. I'm your mother Adam. for me because I have cancer? Help me help you get laid. found out he had cancer. It's your hook man. It's what you've got. to the experience. It can be sad rbgts tragic and trying, difficult. infuse humour into the cancer experience. rare beast, the feel-good movie that may make you feel good at end. but so beautifully handled that they're the film at its best. life and work and what made him so special. likes of Mae West who said something rauk us to him in 1933. Why don't you come up some time and see me. I'm home every evening. started to use him opposite some of their most glamorous leading ladies. it's a work in progress. This is the opening paragraph in that film. gymnast meant he liked to move his body in a witty, graceful way. fellas, when I feel a worry coming on, you know what I do... There! facets of star per sown yaz that he saw when he arrived in Hollywood. ladies. You always felt he wanted their company as much as their body. you to bed. Cary Grant wanted to stay up all noigt and talk to you. who could do what he wanted. So droll, urban and sophisticated. Might he be a bad guy too? He went that way. I think he got off. retired, perhaps it got too hard being carry groont -- Cary Grant. starring Riseboroughise and Michael Sheen. her husband's gone and each man in the village is gone. do you? We must leave. I can't leave. If you stay now, you die. contemporary discussion to be having at this moment in time. stopped on screen. That can't be good. I liked it much more than you. overwhelmed by the landscape? hear you. Wales looks fantastic. think that is your film of the week. What is it? It is very difficult. Nothing but a toilet in a youth club! Constant boil on my bum. you something new. It was both educational as well as entertaining. film about a gay Pakistani in a launderette? It touched people. my wife was launched from a powerboat and hit her head. 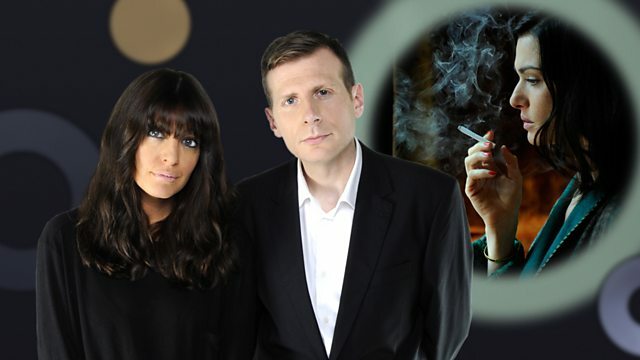 Film news, reviews and interviews with Claudia Winkleman and Danny Leigh. They review Brad Pitt getting sporty in Moneyball, Rachel Weisz going back to the forties in The Deep Blue Sea and Michelle Williams finding her inner diva in My Week With Marilyn. Plus Chris Hewitt counts down his top five sports films.